I am giggling because this is gorgeous AND because I am picturing my guy’s face when I show him his Mac keyboard all customied. Erlend at Morning Creativity came up with these adorable clothespins, just try and say you don’t need some. Shape it and stick it all over the place. Ho, the possibilities! Some washi tape makes tea light candles way more interesting, they don’t have to hide inside a lamp anymore! Blogger Bethany Crowell created this superb card. 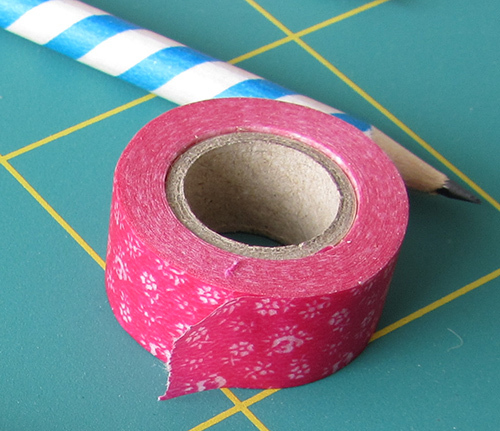 I love the design and it shows very well how washi tape is versatile and can be written on. As I am slightly obsessed with washi tape, I have created a Pinterest board with my favourite tutorials and inspirational pages. I have one roll of it but my friend runs washitapes.uk so i should have a whole lot more. Need a bit more time. Loving the keyboard idea.